If you’re looking for a quick 4-minute gun safe overview, see the Gun Safe Buyer’s Guide instead. Quick Reference – Summary Table showing all recommendations. Gun Safe Size – How to choose a size you won’t regret. Gun Safe Security and Burglary Ratings – Summary of the different ratings available. Gun Safe Price Budget – How much should you expect to spend? Gun Safe Weight – Why you should judge a gun safe by its weight. 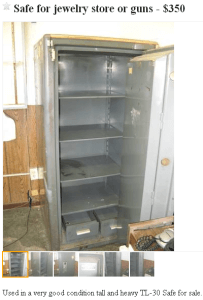 Gun Safe Steel – How much steel you need and where. Gun Safe Doors – Sizing up one of the most confusing areas. Gun Safe Locks – What kind and brand to choose. Gun Safe Bolt Work – Don’t get locked out. What’s important and which features to ignore. Gun Safe Fire Ratings – Ignore the manufacturer’s rating and follow this guide. Other Features and Considerations – Other things to look for. Space- and money-saving tips. This is the sixth and final article in the series What You Need to Know Before Buying a Gun Safe. This table summarizes most of my recommendations. More detail and other recommendations can be found below. Combination Lock Manufacturers La Gard, Sargent & Greenleaf, Kaba Mas, AMSEC, etc. How much do you want to store in your gun safe? Make a list of all the guns you have. Then add all the guns you would like to buy to the list. Then add all mounted accessories you have on your guns like scopes, rings, grips, bi-pods, fore-ends, and other accessories to the list. Also add any unmounted accessories, bipods, grips, spare magazines, and other items you have which you would like to put in your gun safe. If you also want to store other valuables inside, decide this ahead of time and put them on your list. If you want put these valuables in a separate fire safe inside your gun safe, this will take more room. How valuable are the items you want to protect? The value of your guns and other valuables is very important for determining how much safe you need. Add up the replacement value of the items in the list you made. How often will you be opening your gun safe? If you are planning on using the gun safe for storing your daily concealed carry gun and/or a home defense weapon, this will narrow down the options for what kind of gun safe to get. If you’re only planning on opening your gun safe every couple months, you’ll have more flexibility. Safes that are located too far away from common living areas or that take too long to open rarely get used. If you need the items inside on a daily or weekly basis, plan for this ahead of time. Do you want a separate handgun safe for home protection in your bedroom, or will your gun safe need to perform this function? How much theft and fire protection do you want? If you read Assess Your Risk and Desired Protection, you probably already have an idea. Are there any limitations to your desired gun safe location? Pick a location for your gun safe. What are the weight and size limitations? Are there any delivery size limitations like narrow doorways? Do you want to insure your guns? If you do, call your insurance company beforehand. They may not cover you or give you a discount unless your gun safe meets their minimum standards for the insured value. 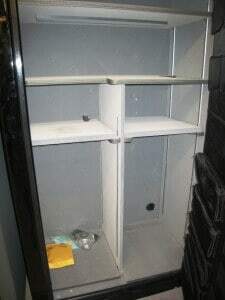 An insurance discount over time could pay for the price difference for a better gun safe, like it did for this reader. Choosing the size of your gun safe is one of the most important gun safe decisions you will make. Gun safe manufacturers like to brag about how many guns they can squeeze into their safes. Marketing pressures in the ultra-competitive gun safe market push advertised high-capacity interiors. A “10 gun safe” is like a “4 man tent”. Any camper will tell you a 4 person tent means it will optimistically fit 2 smaller people with their gear. A 10 gun safe might fit 10 bolt-action rifles or lever-action carbines with steel sights. But, cut that number at least in half if any of the rifles have scopes. Even fewer will fit if you have any modern sporting (black) rifles, as the pistol grips and accessories take up even more space. Unfortunately the push to advertise a large number-of-gun capacity results in interior designs and racks that hold rifles way too close together. If you have guns with pistol grips, wide fore-ends, wide mag wells, and/or long barrels, stock interiors may not be useful to you. If you’re handy you may be better off buying a new safe with no interior or used commercial safe with no interior and installing racks yourself. Even if your safe fits all your guns perfectly, filling up a conventional gun safe to capacity means you’re going to have to take most of them out to get at any one of them. This is a tedious pain in the rear end. Over the years you’ll probably ding a couple stocks and finishes in the process. Even worse, once you get the one out you want, you’ll have to put them all back in just to shut the door and leave the house. When you get home you’ll have to repeat this to put the rifle away again. Very annoying. Even if you’re comfortable with 12 rifles crammed in a 12-gun-safe, once your gun safe is full Murphy’s Law will kick in. Next thing you know, you’ll win a new rifle in a raffle (happened to my friend, twice) or stumble across a screaming deal…where are you going to put it? You will never be able to, or want to, fill up a gun safe to its rated capacity. As a baseline, at least double the number of guns you have to determine the minimum size gun safe to buy. Also, keep in mind that one company’s 24 gun safe may be a different size than another company’s 24 gun safe. If you’re building a place to put your gun safe, or space is tight, don’t trust the advertised dimensions for the safe. These are often adjusted to match the dimensions of competitors’ models. The actual dimensions can vary by an inch or more from what their brochure or website say. Either measure it in a showroom or, if it’s critical, buy the gun safe first. Since most gun safes are made from bent sheet metal, there is also some variations from unit to unit. Make sure you look at the interior size when comparing gun safes. Most gun safe manufacturers advertise the external dimensions. Once it’s installed these dimensions are meaningless. What will be important to you when you use the gun safe is the internal dimensions. The better the fire protection, the thicker the walls will be. This will cut into the interior space. If you have long-barrel varminter or bench-rest rifles make sure these long guns will fit inside. Anyone who owns a gun safe will tell you that “gun safes shrink.” After buying a gun safe, most people acquire more guns within a couple years and fill it up. If your strategy is to divide your gun collection into two safes, then by all means get a smaller gun safe. Otherwise, expect that your gun safe will seem much smaller within months to a couple years after buying it. Once you’ve come up with a comfortable size, if you can afford it and your home can fit it, plan to go even bigger than that. The only time you’ll regret it is if you have to move. The incremental cost of adding a couple more square feet goes down sharply as the gun safe gets bigger. Buying a gun safe that’s a little bigger costs much less than buying a whole new gun safe later. Get a gun safe with at least a UL 1037 Residential Security Container Attack Level 1 (RSC-I) rating. Higher rating recommendations may apply to your situation, see below. Any RSC gun safe built before 2018 is now classified as RSC-I. If you live in California or another state with similar gun storage requirements, you may be required to get a gun safe which meets California DOJ requirements / RSC-I rating, etc. If you’re going to spend money on a gun safe, you should have at least a homeowner’s or renter’s policy insuring your guns. Before shopping for a gun safe, ask your insurance company about security or burglary rating requirements. There also may be a discount for a better rating that will help pay for a more expensive gun safe. If your insurance company hasn’t given you any security or burglary rating guidelines, here are some ideas. I modified the table below from the Graffunder insured value recommendations to make it specific to gun safes. Other insured-value safe-recommendations vary widely, being based on different assumptions and sizes of valuables (cash, jewelry, etc.). 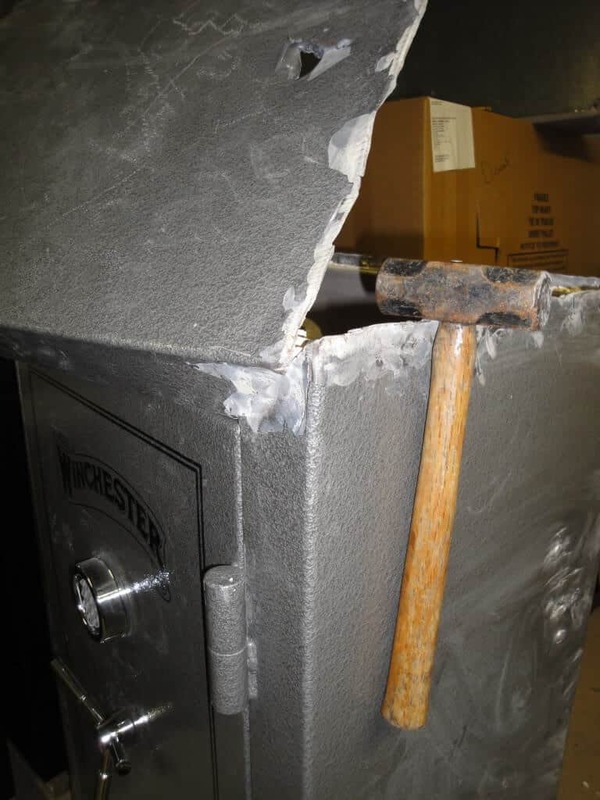 Remember from 11 Myths about Gun Safe Theft Protection that a RSC-I is tested to withstand an attack from one man with basic hand tools and a 1/4″ drill bit for five minutes. Basically one man with a hammer and a small 18″ crowbar can get into to most RSC-I’s in a little over five minutes. With two guys, an ax, pry bar, or power tools, it will take a couple minutes at the most. If a cheap gun safe doesn’t have an RSC-I rating you may be better served buying a large toolbox, locker, or gun cabinet. 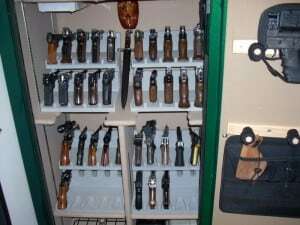 Or, you can build a closet gun safe, hidden gun safe, hiding spot, or other gun safe alternative. Unrated gun safes also generally have unreliable unrated locks. These can cause you significant aggravation. Although RSC-I gun safe prices range from $500 to over $10,000, most professional safe smiths agree that there is very little difference between the protection of a cheap and expensive RSC-I rated gun safe. A more expensive RSC-I may slow down a burglar for another couple minutes. But, is 2 more minutes is worth the $1,000 or more price difference? If you’re looking for a new RSC-I gun safe, get the cheapest one you can find with the features you need. *With that said, there are two specific RSC gun safes worthy of your consideration before you step up to a B-Rate true safe. I included a column in the table above labeled “*Exceptional UL 1037 RSC” to account for these models. These “exceptional RSCs” are the starting point for protection against brute force attacks. If your gun collection is valuable enough to require more serious protection, you have plenty of options. Few of them will come from gun safe companies. Notice from the table that there’s a big gap in the Replacement Value of Contents between the RSC-I rating and a B-Rate. This reflects the difference in the protection between the two. A B-Rate safe is the minimum level of real protection from brute force tool attacks. B-Rate safes have 1/2″ (0.500″) plate steel and the door and 1/4″ (0.250″) plate steel walls. Even with that much steel, the power tools designed to cut metal will still eat up a B-rate safe. This is reflected by insurance company coverage, as there’s a significant difference in coverage even between a B-Rate and a C-Rate safe. To bridge the gap between the performance ratings of UL 1037 RSC-I and UL 687, Underwriters Laboratory released the UL 1037 Residential Security Container Attack Level 2 standard. In 2018, the first gun safe passed the RSC-II testing. That model exceeds the definition of B-Rate, so unlike RSC-I, RSC-II is a true safe performance standard. If you want protection from power tools designed to cut metal, you’ll need an even higher rating. The lowest UL burglary rating which actually tests against metal cutting tools is UL 687 TL-30. If your collection is this valuable, your insurance company needs to be involved with the specifications. You’ll also want to read here, where the Security and burglary ratings are covered in detail. For specific recommendations in each of these categories see Best Gun Safe. There are a lot of unrealistic expectations about the cost of securing guns. It’s true that gun safes are expensive and not as much fun as many other things you can buy. But at today’s prices, it’s not hard to accumulate a $10,000 collection of guns, including optics and accessories. Is it outrageous that a decent gun safe to store $10,000 in guns would cost at least $1,500? Would you put $10,000 cash in the corner of your closet or under the bed in a plastic case? This raises a very important question which isn’t discussed much: How much can you expect to budget for securing your firearms? Expect a gun safe’s or (true safe’s) original retail price to be around 10% to 30% of the replacement value of the contents. Note I said “original retail price”. You can find a used gun safe or a used commercial safe for under $1,000. So, it’s good to first get an idea of what you want before worrying about the price tag. Where you wind up in the 10% to 30% range depends on many factors. Some of the factors are how well insured your collection is. Others include the type of guns, if they are rare, have sentimental value, if they’re replaceable, what your home’s burglary risk is, your tolerance for risk, how many people know about your collection, etc.. Handgun Collections are at higher risk than Long Gun Collections, because they’re more popular with burglars. Handguns are very popular among thieves, so expect to spend more to protect a semi-automatic handgun collection than a collection of black powder or bolt-action rifles. These risk factors have been discussed in detail. We all need to be wise with our money these days. In these times of disposable products though, it’s important not to be “penny-wise and pound foolish”. If the electronic keypad to a no-name safe wears out in 5 years and the company is gone, will you be able to find a replacement? Or if the lock fails on a cheap Chinese safe and there are no locksmith plans to open it without destroying it, you’re going to have to buy another gun safe to replace it. Prices for steel and other materials are rising sharply, which we all know know from ammunition prices. The $2,000 gun safe that seems so expensive now may seem like a bargain when it costs $2,500 a year from now. If you’re going to buy a gun safe, it’s a good idea to buy the best you can today, because it will not be cheaper a few years from now. All of the materials used in real safes, namely steel and concrete amalgamates, are heavier than those used in RSC gun safes. A surprisingly reliable way to compare the construction of gun safes, without cutting them open, is to compare their weights. Given similar sizes, the heavier one will generally be harder to break in to. If the prices are similar but there’s a large difference in weight, look deeper. Instead of security you’re probably paying for glossy enamel paint, chrome plating, a fancy interior, and other cosmetic features in the lighter one. If the prices are different for similar size and rating, check the weight. It’s a good way to make sure you’re actually paying for more steel. Again, the price premium may not be put towards security (steel). Gun safe companies use all kinds of marketing gimmicks to mislead customers into thinking that their gun safes are better than their competitors, but they can’t fake weight. A 60″ tall weak RSC gun safe will weigh between 300 and 800 lbs including the fire proofing. The same size safe in a B-Rate with concrete amalgamate fire proofing will weight around 1,200 to 1,500 lbs. Even without the fireproofing it will weigh around 600 lbs of solid steel. Heavier gun safes are better until you have to move, so think about how often you’ll have to move the thing. Instead of the caliber of your bullet, or the displacement of your engine, apply these adages to the thickness of steel in your gun safe. Steel is the most expensive part of a gun safe or true safe and the first corner-cutting area used to cut costs. It is also the most important area for burglary protection. It is essential that your gun safe have substantial thickness of steel in the door and walls. Despite marketing and advertised protection features, without a minimum level of steel any gun safe can be opened in minutes. Nearly all gun safes fail miserably in this area, especially overseas manufactured safes. That’s because overseas-manufactured safes must pay for both the steel, and for shipping the safe to the USA. Do not buy a safe without learning the actual steel thicknesses of all the individual sheets in both the door and walls. There are a couple misleading tactics by gun safe marketers. Total door thickness is usually advertised instead of steel thickness. 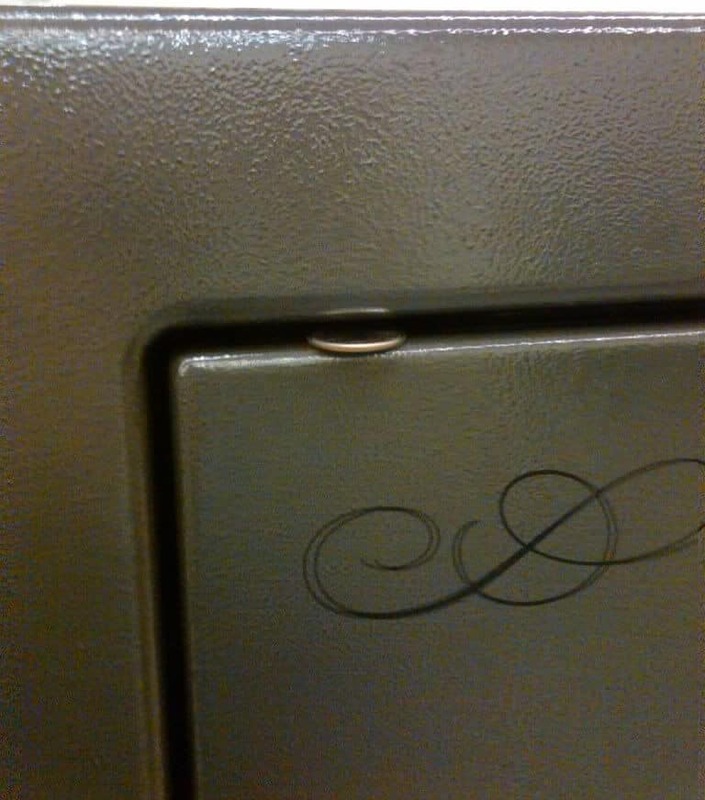 Most gun safes have thick robust looking doors, but only a small portion of the door is actual steel. Most of the door is gypsum drywall (Sheetrock) wrapped in thin sheet metal. Gun safe doors may be advertised as “5 inches thick”, which includes the safe dial, steel, drywall, bolt work space, air space, and inner panel. Door thickness tells you nothing about the security of the safe. Total wall thickness – “2 inches thick walls” sound impressive, but are often made from an outer shell of 14 Gauge (0.0747″) steel and a few layers of drywall. 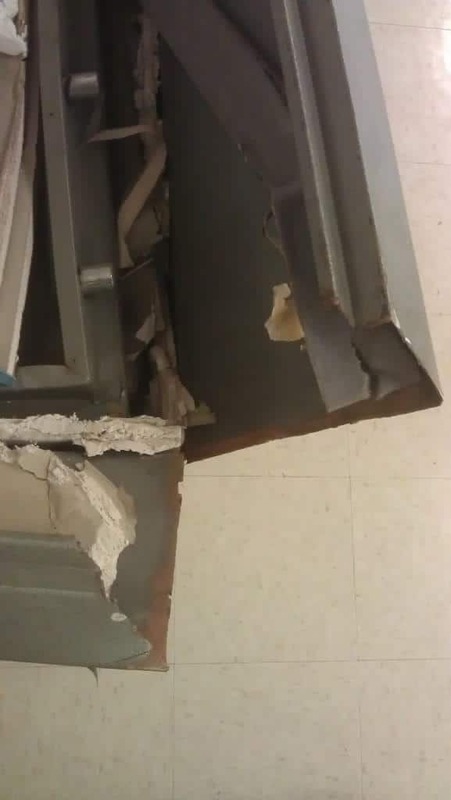 Obviously 2″ of Sheetrock is not as strong as 2″ of steel, so don’t be confused. Combined steel thickness – On higher end gun safes an impressive sounding steel thickness will be quoted in the door or walls. This is often the sum of two different sheets of steel, separated by gypsum drywall. For example, the Heritage Ultimate brags about a respectable 3/16″ (0.1875″) steel body, but this is 1/8″ (~11 gauge) outer body plus 1/16″ (~16 gauge) inner liner. The Sheetrock offers no structural support for the steel and actually makes it easier to hack through, much like karate chopping spaced boards is easier than one thicker board. Two sheets of steel thin enough to hack through with an ax offer less protection than one sheet of the combined thickness that can’t be. Remember the higher the gauge number, the thinner the steel. 10 gauge steel is thicker than 14 gauge steel. This article has more information about steel thicknesses and gun safe construction. 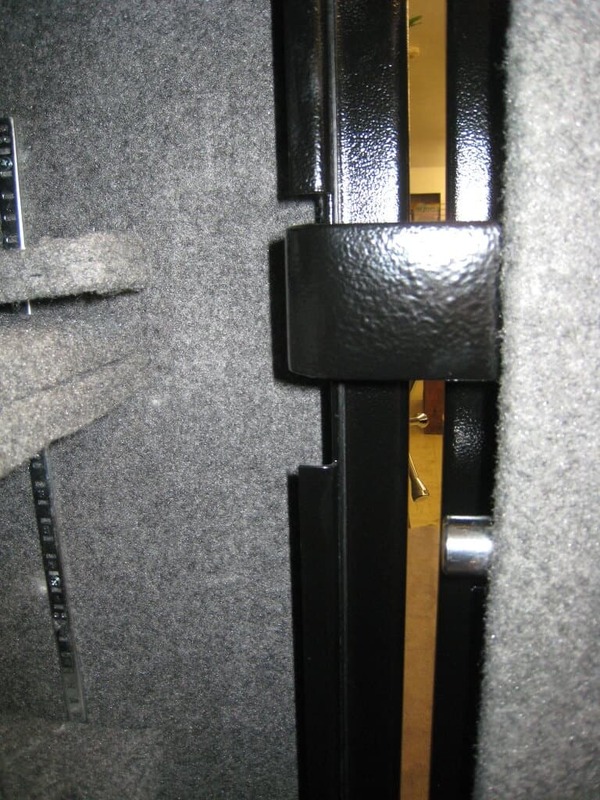 Get a gun safe with no thinner than a 7 gauge (0.1793″) Outer sheet in the gun safe door. The thicker the steel on the outer surface, the better. Any other steel layers are just a bonus. Plate doors are preferable to “composite” outer door edges. Even a “thin-looking” 7 gauge (0.1793″) outer plate is much harder to deform than a “thick-looking” 3/4″ composite door edge made of 12 gauge (0.1046″) steel wrapped around a piece of Sheetrock. The walls and top/bottom sides of a gun safe are the thinnest and easiest sides to hack or cut through. Get a gun safe with no thinner than a 10 gauge (0.1345″) single sheet in the gun safe walls. The 12 gauge steel in most gun safes is only good for keeping honest people out. Even 10 gauge steel can be hacked through with a fire ax in a few minutes as shown in the previous video. However, if you locate the safe intelligently, bolt it down, and block access to the walls and top/bottom you’ll improve your protection. Safes with poured concrete amalgamate linings are a different animal than traditional gun safes. Depending on the mixture, these linings can add structural support to the gun safe. An interesting question is whether the thicker body sheet steel should go inside or outside. Some companies like Brown and the AMSEC BF-HD put the thicker sheet on the inside of their safes. Here the additional steel’s thermal mass can help in fire protection by slowing the temperature rise inside the safe. 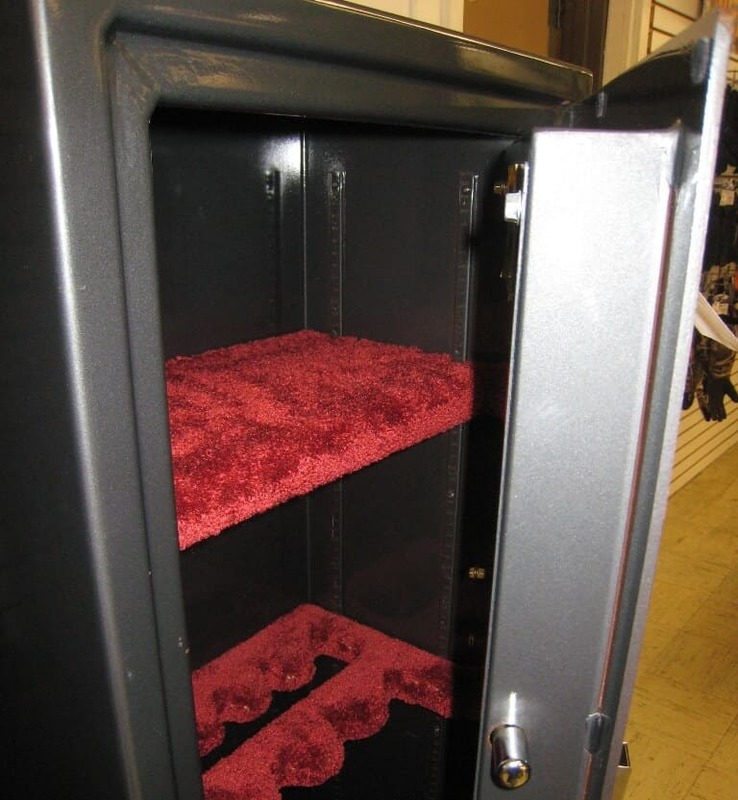 The majority of gun safes have the thickest sheet on the outside. Properly welded joints with full weld penetration are stronger than the base metal. In welding class we would test our welds by beating them with hammers to make sure the surrounding metal failed before the joint did. Welding long joints in thin sheet metal is actually tricky. The thinner the metal, the harder it is to weld. For one, you have to be careful about how much heat you put in to avoid burn-through. Another concern is that steel doesn’t transfer heat as well as other metals. So as you weld, the area around the weld will get hotter faster than it can dissipate to the rest of the sheet. As the hot steel expands it can cause deformation of the sheet metal. The deformation can open the un-welded part of the joint, and leave waves and ripples in the metal. Since this metal is the cosmetic outside of the gun safe, any distortion in the metal will need to get filled and sanded before painting. To avoid this, a welder can weld short sections at a time, limiting the amount of localized heat put into the metal. This is generally called “skip-welding”. The welder is supposed to come back and fill in the gaps between the welds, rotating around until a continuous weld is achieved. In cheaper gun safes, the skip welds are not connected, leaving the joints non-continuous and much weaker. Plastic body filler compound is put in between the welds to make the joint look continuous, when it is not. To top it off, filler material is flammable. The outer seams are the most vulnerable to opening up in a fire, putting the flammable filler material in direct contact with the flames. Starting and stopping welds is time consuming. Since most gun safes are MIG welded, this is especially true. To be done properly, MIG requires an extra step of cutting off the burned tip of the feeder wire before every weld start. MIG welding is also notorious for cold joints at weld start, which are weaker than proper welds. Modern MIG welding machines do have technology to prevent this. But is a corner-cutting cheap gun safe welded in China, Mexico, or even the USA likely to have the latest and greatest welding equipment working on it? Another problem with gun safe welds is that the outside of these welds are cosmetic. Many companies grind down the outer corners to make them more appealing. It’s not uncommon for welded joints to be ground and polished after welding in a variety of applications. But when the base metal is very thin sheet metal, like 12 gauge (0.1046″), workers need to be very careful not to damage the joint by over-grinding. If they grind off too much metal they should really weld it back up and grind it again. But that rework is time consuming. Since an angle grinder can cut through 12 gauge steel in seconds, any seam grinding is likely to weaken the joint. This Gun Safe was dropped, and the crappy cold welds split right open. The gun safe market is extremely competitive. Most gun safe manufacturers are trying to save time and money at each step. Some of these methods are good and some are bad. One of the bad cost cutting methods is to play games with the penetration of the weld. A cold weld with less penetration allows faster, longer welds before the metal deforms. This means fewer time consuming starts and stops. Unfortunately it also makes the welds less strong than the surrounding metal. In security terms, these welds are vulnerable to failure when beaten with a hammer. 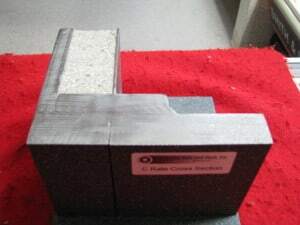 This is why the UL 687 construction ratings specifically require “continuous 1/4″ penetration weld”, which can easily be verified by cutting a cross-section of the joint. The thicker plate steel in walls and doors of a real safe are stronger and less likely to deform during proper welding. In the C-Rate cross section shown below the weld penetration is well beyond 1/4″. Graffunder C-Rate Safe Cross Section showing plenty of weld penetration. Since welding is time consuming and expensive, most gun safe manufactures make creative use of sheet metal bending to eliminate welding joints. The safe bodies generally have a one piece metal wrap-around with no vertical seams, including the door jamb. The elimination of these long vertical weld joints is a good thing, especially if you can’t trust the manufacturers’ welding. There may be some gun safe welders reading this, and I don’t mean to malign them or their work. But they will agree that many gun safe buyers are interested in the lowest price possible. There are many companies that produce low cost gun safes. It can be difficult to maintain quality in that environment. Welding machines may be old models without the latest sheet metal welding technology. They may not be maintained and adjusted properly. Pay may be too low to attract experienced welders. Welder training budgets may be low or non-existent. There may be a lot of employee turnover. Problem employees may produce defective units for weeks before they’re discovered and fired. If you’re looking at cheap RSC gun safes made of thin steel, a gun safe welded by a robot welder will offer more consistent joint strength than one welded by a person. The robot welder is also more likely to have modern welder technology designed for sheet metal. Gun safe welds must be continuous and full-penetration. Welded seams should be minimized, and robotic welded joints are preferred on low end gun safes. Since a gun safe isn’t very useful if it isn’t bolted down, your gun safe should have four proper bolt holes. The holes should be in the outer corners of the base of the gun safe to make it hard for a pry bar to get purchase under the gun safe. Some Chinese gun safes have holes in the middle of the base. This demonstrates that they don’t have a fundamental understanding of what they’re doing. The bolt holes should be reinforced to make the bolts harder to rip out. A 1/2″ (0.500″) bolt isn’t much help if it’s fastened to thin 12 gauge (0.1046″) steel. Gun safes are very tall which gives a large lever arm for applying force to bolts. The corner of the gun safe also makes a strong fulcrum for ripping out bolts. Information and instructions on anchoring gun safes is covered in Where to Put a Gun Safe. This is one of the weakest areas of gun safes. Anything is better than the typical “composite” gun safe door construction. A plate door with a solid outer steel sheet is preferable to a composite outer door, even if it looks thinner. Stick your head inside the gun safe and check out the door jamb, especially the lip that the locking bolts secure behind. In most gun safes this is just a sheet metal edge. Any extra supports or gussets in this region are beneficial. 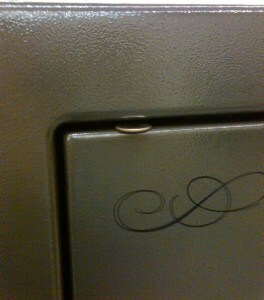 Gun Safe Door Gap with Dime. 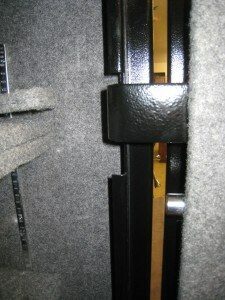 Most gun safes have huge door gaps, more than wide enough to get a pry bar in. True safes have door gaps sometimes so thin you can’t get a credit card in between the edge of the door outer plate and door jamb. The more recessed a gun safe door, the harder it would be to get a pry bar in. Specifically this means the distance from the front face of the door jamb to lip that the door closes against. Picture sticking a pry bar in the door gap behind the door and you’ll understand. You want a gun safe with as little door gap as possible, and preferably a recessed door. Hinges have nothing to do with the security of a properly made gun safe. Any gun safe you consider must have locking bolts or a welded tongue on the hinge side of the door. These locking bolts should really just be fixed. All they have to do is hold the door shut on hinge side. If the gun safe you’re looking at doesn’t have bolts on the hinge side, run away! Gun Safe Internal Hinges. Make sure fireproofing is not cut out for clearance when the door is shut. Internal hinges only let the door swing a maximum of 90° open. Often gun safes with internal hinges will have part of the fire lining cut out for the hinges to fit in when the door is shut. Typical gun safes are pretty weak, so swinging an internally hinged gun safe door open too hard can bend the door jamb. Also internal hinge doors can’t be removed or adjusted. They allow the door to swing open 180° open, which you’ll appreciate every time you open your gun safe. External hinge doors are serviceable. They can be adjusted years down the line if your gun safe gets racked or the door is out of alignment. If you’re moving the gun safe up stairs, externally hinged doors can be removed to make the gun safe lighter. Inexperienced burglars may also waste a lot of time cutting off the hinges before they find out the door still won’t open. Get a gun safe with external hinges. Many low-end gun safes are sold with no door sealing at all. Not good. A door seal helps the dehumidifier or desiccant inside your gun safe to keep moisture off of your guns. In a fire a door seal is necessary for any kind of fire protection to keep out smoke, fire, hot gasses, and firefighting water spray. Remember that in a fire the temperature just a few feet off the floor can get to 600 °F within minutes. Without a door seal, gasses this hot will get inside your gun safe and will destroy wood, paper, and melt composite stocks within minutes. Gun safes with any sort of fire protection should come with an intumescent door seal. Intumescent means heat-activated expanding. The leader in these products is the BASF brand Palusol, which expands to 7 X its volume when heated to 248 °F. As it expands it seals your gun safe door from the smoke, hot gasses, and water spray outside. Get a gun safe with a Palusol door seal running around the entire door sealing face.